Music for the season of Epiphany – the liturgical period that falls between Christmas and Lent - takes centre stage courtesy of Noteworthy Voices, the town’s leading chamber choir, this month. The 24-strong ensemble is busy rehearsing for the first concert of 2019 with inspiring and uplifting works from a variety of musical eras, but with a sacred nod to the post-Christmas part of the church’s year, prior to the beginning of Lent. The choir’s O Balow, Lalay concert, on Saturday February 16 from 7pm at St Nicolas’ Church in Pevensey, will include works from living composers Christopher Chivers, Jonathan Dove, Morten Lauridsen and Estonian Arvo Pärt, as well as older works by Tomas Luis Victoria and Jehan Titelouze. The evening’s sacred delights will be led under the expert baton of Musical Director Alexander Eadon, who is also Assistant Director of Music at Eastbourne College. 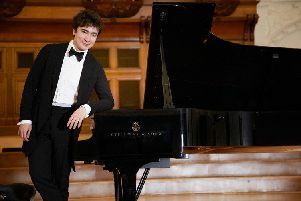 Alexander began his musical life as a chorister in the world-renowned choir of Kings College before more formal training at the Royal Academy of Music and Middlesex University. His career flourished with tenures as Director of Music at Christ Church, Southgate, and organist at Tewkesbury Abbey. Tickets at £7 are available on the door (children go free) or via www.noteworthyvoices.co.uk.